Home / Local / News / Trending / Video / Legal Wife at Kabit, Nanirahan sa Iisang Kwarto Kasama si Mister! Legal Wife at Kabit, Nanirahan sa Iisang Kwarto Kasama si Mister! This is the infuriating story of a legal wife and her husband's side chick who used to be bestfriends. It's one painful thing to find out that your legal husband has been sneaking behind your back to sleep around. But it's a thousand times more painful finding out that the other woman is your bestfriend. Still, in this particular story, netizens cannot give a hundred percent of their sympathy to Katrina Tacutaco, the legal wife. You see, it's like she enabled the indecent relationship for the longest time. You see, at one point, Katrina lived together under the same roof with Espie and the husband! 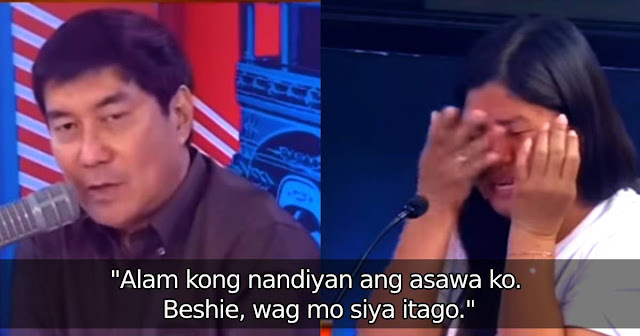 Even Raffy Tulfo cannot believe what he was hearing. He was dumbfounded to find out that Espie, the side woman, even cooks food, makes coffee, and hands out massages to the legal wife! Still, Raffy was insistent that Katrina should not have agreed to this setup. "Sana hindi ka pumayag nung sinabi ng asawa mo na Tara, sa isang bubong tayo titira ng kabit ko." Raffy Tulfo told Katrina she shouldn't have agreed. Instead, she should have responded with a crisp "go to h3ll." Katrina defended herself, saying she was only thinking about the welfare of the kids! You see, Katrina and husband Virgilio has an only child. However, Virgilio sired a total of 5 kids with his side woman Espie! So, if Katrina was nice enough to live under the same roof-- and the same room, even-- with her husband's side chick, what does she want in paying Tulfo a visit? Well, as it turns out, Katrina's only child-- the only legal one-- is running out of funds! All of Virgilio's money actually goes to the second family! Basically, Katrina says she doesn't care if her husband goes home to the side chick every single day, as long as her kid gets all the subsidy she deserves from the father! This is an unbelievable story that even Raffy Tulfo had a hard time figuring out.